The foul mouthed fowl is back! To give a little backstory on this character, he made his first appearance in Adventure into fear #19 in 1973 and due to his popularity was given his own series which ran for 33 issues from 1976 to 1983. In this time he had some iconic stories including running for President, team-ups with Spider-Man and introducing legendary rock band Kiss into the Marvel Comic world. 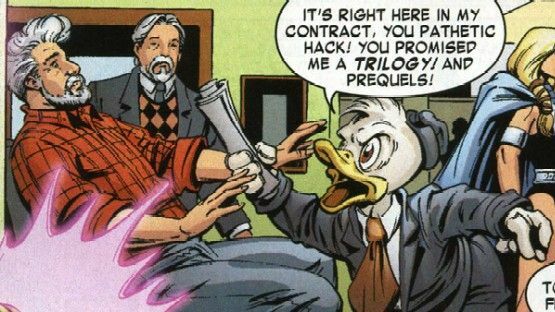 After the success of Star Wars and whilst in the middle of the Indiana Jones films George Lucas decided to make a Howard the Duck film. (Fun Fact #1 – This was the first ever feature film based on a Marvel comic) which was released in 1986 and completely bombed. The failure was so bad that Lucas had to sell off a huge amount of assets to stay afloat and to this day is still widely recognized as one of the worst films ever made. Howard’s popularity had taken a hit and whilst over the years had a few appearances in other story lines and a few issues of his own, he never really regained his reputation of the initial comic run. 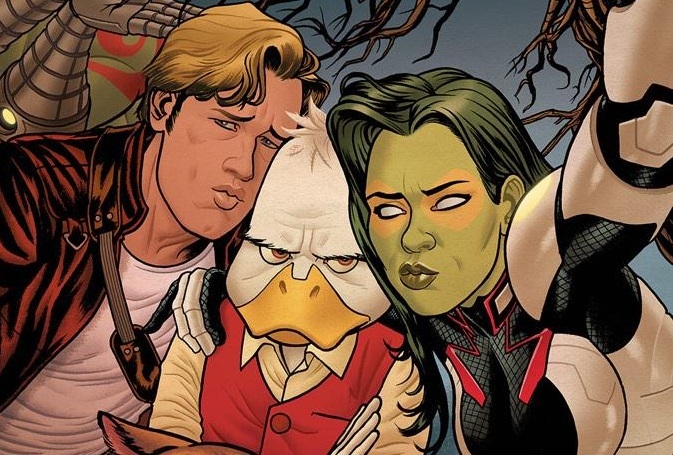 Fast forward to 2014, genius James Gunn decides to throw the character in to the Guardians of the Galaxy after credits scene, with 5 seconds of screen time his popularity reaches a new all-time high and Marvel decide to relaunch his series! In this collection of Howard the Duck #1-5 we find the foul-mouthed fowl trapped in a world he never made (but has grown accustomed to) taking on some very strange cases as the Marvel Comic Universe’s resident private investigator. The first case he takes on goes wrong taking on the Black Cat and lands him in the Collector’s clutches with a familiar prison mate – Rocket Raccoon! From here the story takes us along Howard’s ridiculous and hilarious adventures getting back to earth, investigating a senior citizens crime spree, having some entertaining interactions with Spider-Man, teaming up with Doctor Strange and making a friend in new character Tara Tam. Chip Zdarsky is a superb writer for this series. Comparable to how well suited Duggan is on the Deadpool run, Zdarsky is perfect for this comic and just makes this his own. The comics capture elements of what I love about the original Steve Gerber series whilst being its own entirely new comic. Similar to the original comic run we get Howard poking fun of comics and social satires and there is a ridiculous pace to the comedy delivered and a total disregard to the Marvel Universe which makes for a very fun read. Zdarsky’s writing is complemented by the art of Joe Quinones. Quinones does great work in jumping between Howard’s day job environment to his unwanted cosmic adventures. Generally his art is clean and simple for the most part yet expressive and extravagant when the panels need it to be. Let’s not forget Howard is now complete with a new look (Fun Fact #2 – Disney filed a lawsuit because he looked too much like Donald Duck and the changes to be made included smaller eyes, a different hat and he had to wear trousers! ).